"Addon Manager With Profiler" is a lightweight extension to help you manager your addons from a toolbar panel. The extension allows you to define multiple profiles in which you can disable or enable particular extensions to free up the toolbar area and optimize your work area. What is Addon Manager with Profiler extension and how does it work? 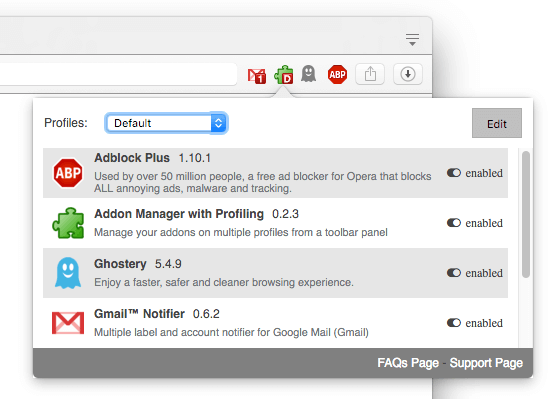 Addon Manager with Profiler aims to provide an easy way to access all your extensions from within a toolbar panel. People usually install many extensions, but most of these extensions are not always required and just get some area of your browser toolbar plus overload the browser. Using Addon Manager with Profiler you can define multiple profiles for instance for you work and home. If you are not using some extensions in some situations, simply disable them on a profile. Whenever you need them switch back to the defined profile and all extensions will be enabled. This way you can free up your toolbar area whenever extensions are not needed also having the minimum number of extensions helps your browser function smoother. Why in Firefox, I cannot see the list of all installed add-ons? Well, Firefox browser supports two types of extensions. Extensions can be bootstrapped (restartless), or traditional. There is no point on adding the traditional extensions in the list as disabling or enabling them requires browser restart. What is the usage of profiles and how can I create a new profile? When I create a new profile what would be the default status of the installed extensions? When a new profile is created, the enable and disable status of extensions are copied from the currently selected profile. If I disable or enable an extension from addon manager, does Addon Manager with Profiler respect my changes? Yes, your current profile will be updated as soon as you open the toolbar panel. What is the meaning of the character printed on the label of the toolbar button? Addon Manager with Profiler prints the first letter of the profile name in the badge area. If mouse is hovered over the toolbar button the full name is displayed as well. Can I change the width or hieght of the panrl? Yes, open options page. There are two settings related to the panel dimension there.